Frederik Gauthier notched a goal and an assist during the second period when the Maple Leafs scored four times, and Toronto held on to defeat the visiting Buffalo Sabres 5-3 Monday night. Kasperi Kapanen added a short-handed goal in the third period and had an assist for Toronto. John Tavares, Auston Matthews and Tyler Ennis each scored once for the Maple Leafs, who have won both games between the teams this season. 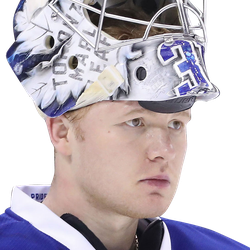 Frederik Andersen made 31 saves for Toronto. Eichel scored his 20th goal of the season on a power play at 19:07 of the first period on a wrist shot from the high slot. Reinhart's pass set up Eichel seven seconds after Toronto was called for too many men on the ice. The Maple Leafs scored three goals in a 2:04 span early in the second period to take a 3-1 lead. Tavares scored his 35th of the season at 3:48 of the second, deflecting a point shot by Jake Muzzin. Matthews scored his 30th at 5:24, shooting home a loose puck from in front of the net. Gauthier notched his third this season on a backhand from the slot at 5:52 on a pass from Jake Gardiner. Linus Ullmark replaced Carter Hutton in the Sabres net after the third goal. Hutton stopped nine of 12 shots. Ullmark made 19 saves on 21 shots. Ennis scored his ninth goal of the season at 13:07 of the second after Gauthier's pass put him in the clear at the Buffalo blue line. Reinhart picked up his 18th of the season at 17:25 of the second on a pass from Jeff Skinner when the Sabres had a two-man advantage. Muzzin (interference) and Nikita Zaitsev (tripping) were serving penalties for Toronto. Eichel scored his 21st of the season nine seconds into the third period on a shot from the right circle. Kapanen scored his 19th goal this season, short-handed, at 17:42 of the third. Matthews had 11 seconds left on a tripping penalty. Toronto's Nazem Kadri missed his third straight game with a concussion.